Malaysia Airlines (MAS) has incurred another steep loss for the quarter ending 30-Jun-2014 as already unfavourable market conditions were exacerbated by the MH370 incident. The flag carrier is expecting more steep losses in 2H2014 as it tries to recover from the unprecedented twin tragedies of MH370 and MH17. The deep restructuring which MAS has needed for years but never was able to implement due to political and union opposition seems to finally be in sight. Capacity and job cuts are expected to be implemented over the final months of 2014, putting MAS in a stronger but still challenging position for 2015 and beyond. Rebuilding the brand and overcoming intense competition in the Malaysian and broader Asian marketplaces, where other airlines will be eager to fill any voids left by MAS, will be immensely difficult. There is no guarantee a smaller and nimbler MAS will succeed. But continuing the prior strategy of ambitious expansion along with aggressive pricing is clearly not an option. MAS on 28-Aug-2014 reported a net loss of MYR307 million (USD95 million) compared to a loss of MYR176 million (USD58 million) in 2Q2013. Revenues decreased by 5% to MYR3.590 billion (USD1.110 billion) despite a 9% increase in ASKs and flat RPKs. For 1H2014 MAS incurred a loss of MYR750 million (USD230 million) compared to a loss of MYR455 million (149 million) in 1H2013. Similar and potentially steeper losses are expected in 2H2014. MAS stated in releasing its 2Q2014 results that average weekly bookings declined by 33% in the immediate aftermath of MH17 and the group is now “doubling its effort to proactively engage with various quarters and working hard to regain the confidence of the public in Malaysia Airlines”. Commissions have increased to Australian travel agents. MAS’ majority shareholder, government-linked investment firm Khazanah, is expected to announce a restructuring plan for MAS by the end of the day on 29-Aug-2014. Khazanah on 8 Aug-2014 proposed buying out the 30% stake in MAS that it does not already own. If approved MAS will be delisted and fully nationalised, which in theory should make it easier to pursue the deep restructuring that is required. The delisting however will likely not be completed until late 2014 or early 2015. The impending restructuring is expected to include capacity and job cuts as well as potential adjustments to the carrier’s fleet. While heavy losses are expected for 2H2014 MAS could start to see an improved performance in 2015. But profitability will be very difficult to achieve – even in the long-term – given the flag carrier's current weak position and the intense competition in the Southeast Asian market. 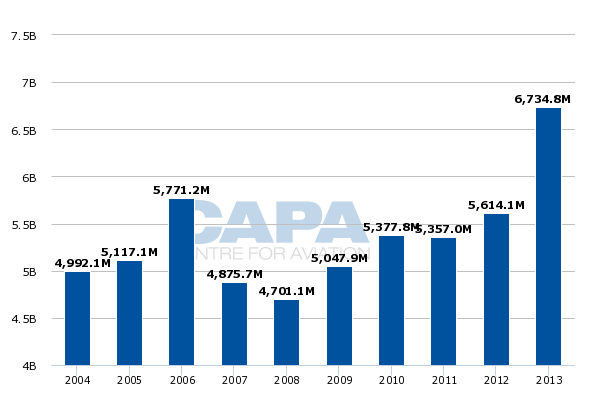 The 2Q2014 loss marked the six consecutive quarter MAS has been unprofitable. The carrier was unprofitable every quarter in 2013. It was profitable in 3Q2012 and 4Q2012 but was unprofitable for the full year in 2012 as well as in 2011. Before the MH370 incident MAS expressed confidence that it could be profitable by the end of 2014. But in reality it was highly unlikely the carrier would have been able to turn around. Market conditions remained challenging and the airline’s pricing strategy, which drove record passenger numbers and load factors in 2013 at the expense of yields, was not sustainable. The MH370 and MH17 incidents exacerbated the situation, forcing MAS to discount even more steeply. Yields as a result slipped further while load factors also dropped, leading to even larger losses. MAS’ passenger yield was down by 4% in 2Q2014 while its load factor dropped 6.7ppts to 73.7%. The result was a negative 9% net margin compared to negative 5% in 1Q2013. The 2Q2014 yield figure does not seem too dismal given the circumstances but came off an already very low base. MAS’ yields have been tracking down since 2Q2013, when MAS began an aggressive pricing strategy in a bid to boost traffic and load factors despite intensifying competition. For the full year in 2013 RPKs were up a staggering 27% while ASKs increased by 17% as MAS responded to intensifying competition, including the launch of Lion Air Group Malaysian affiliate Malindo Air, by accelerating capacity expansion and engaging in heavy discounting to stimulate demand. Yields dropped 13% for the full year in 2013, including a 16% drop in 4Q2014. Yields dropped by a further 9% in 1Q2014. The 1Q2014 figures were only slightly impacted by MH370 as the incident occurred with just over three weeks remaining in the quarter. In reporting 1Q2014 earnings in May-2014 MAS said it fell 4% short of its sales target for 1Q2014 as it had to immediately withdraw from marketing activities after MH370, including participation in a Malaysian travel fair that typically generates significant sales. Marketing activities resumed in May-2014 with an aggressive campaign to regain market confidence and win back passengers. In the 2Q2014 results statement, Mr Ahmad Jauhari stated that the market started to respond positively to this initiative in May-2014 and Jun-2014 but added that “just as we were beginning to see signs of recovery in all regions we were dealt the blow of MH17”. However MAS would almost certainly still have been highly unprofitable in 2Q2014 without MH370. MAS was already starting to see its load factor trend down in the first two months of 2014 despite continued yield declines, an indication of the challenging market conditions. As a result it appears MAS’ ability to fill up seats was already slipping before MH370. 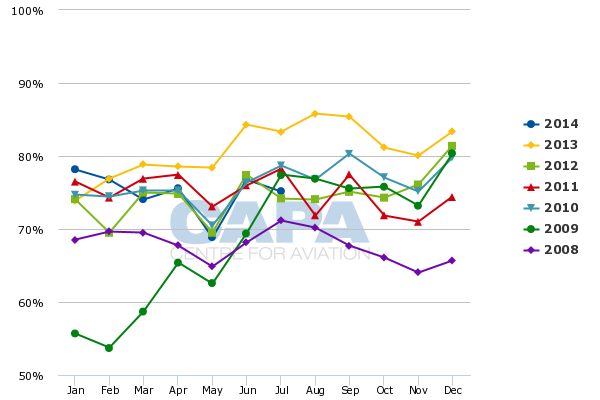 Jan-2014 marked the first time in eight months MAS’ load factor was below 80%. 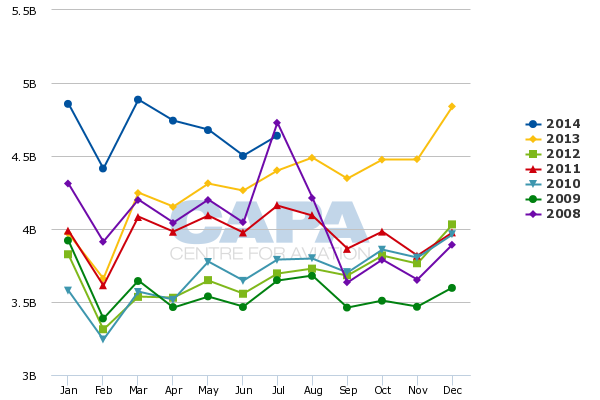 The carrier’s factor was up significantly for most of 2013 and ended the year at a record 81%, up 6.3ppts from 2013. MAS’ load factor has slipped in the four months since MH370 but only slightly. For the first seven months of 2014 the average load factor was 75.1%. 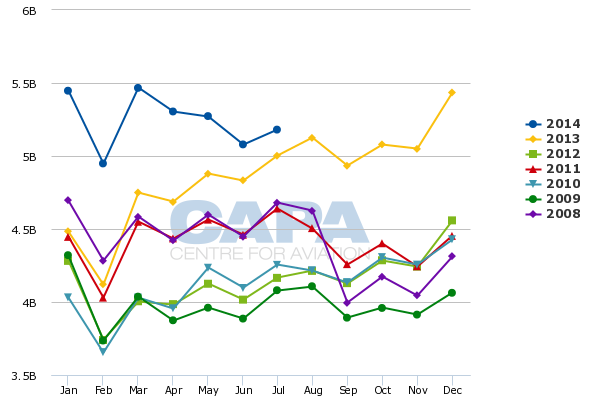 The most recent month, Jul-2014, the load factor was 76.1%. Passenger growth also has slowed considerably in recent months. Passenger numbers increased by only 0.4% in 2Q2014 to 4.2 million. In Jul-2014 passenger numbers dropped by 11% to 1.3 million but this is somewhat misleading as domestic traffic was down 23% to 434,000 due primarily to Ramadan as Malaysians typically do not travel during the fasting month. International traffic was also down in Jul-2014 but by a more modest 5% to 887,000. MAS passenger numbers were up 29% in 2013 and another 21% in 1Q2014. The recent slowdown reflects partially the impact from MH370. But it also reflects a shift in year over year comparisons as the capacity increases in 2013 were implemented over the last nine months of the year. ASKs were up 8.8% in 1Q2014, including a 4.3% domestic increase and a 9.3% international increase. But this was driven by capacity added in the last three quarters of 2013 rather than in early 2014. RPKs in 1Q2014 down 0.3%, resulting in a 6.7ppts drop in load factor to 73.7%. On a quarter over quarter basis ASKs in 2Q2014 were down by 1% compared to 1Q2014. RPKs were down 5% on a quarter over quarter basis, driven partly by MH370. MAS’ load factor was 76.4% in 1Q2014. In discussing its 1Q2014 results in May-2014 MAS executives said full year ASK growth had been adjusted from an initial plan of 19% to between 10% and 12%. Through the first seven months of 2014 ASK growth was 12%. As CAPA previously outlined, MAS started reducing capacity in 2Q2014 by cancelling flights on an ad hoc basis, primarily off peak flights on high frequency routes. The restructuring plan to be implemented by Khazanah over the next few months is expected to include more permanent cuts. But the cuts will probably only have a limited impact on total 2014 ASK figures as they are not likely to be implemented until 4Q2014 at the earliest. So far the ad hoc cuts have brought down monthly ASKs by roughly 5%. On a month over month basis MAS ASKs levelled out in 1Q2014 and started coming down slightly in 2Q2014. ASKs were up only 3.6% in Jul-2014, the lowest monthly gain since Dec-2012. But this was partly driven by Ramadan, which this year fell almost entirely in July while in 2013 it was only partially in July. All Malaysian carriers typically reduce capacity during Ramadan, particularly domestic capacity as Malaysians elect to stay home during the fasting month. MAS’ domestic ASKs were down 10% in Jul-2014 while international ASKs were still up by 5% year over year. The permanent capacity cuts to be implemented as part of the new restructuring plan will go much deeper and should bring MAS back to 2012 levels (or even lower) in 2015. Even with the recent adjustments current capacity levels are still about 20% above where they were in 2012. As part of its last restructuring plan, which was announced in late 2011 and implemented in early 2012, MAS initially cut capacity (system-wide ASKs) by 12%. This included a rationalisation of the network as several heavily unprofitable long-haul routes were axed including Buenos Aires, Cape Town, Dubai, Karachi, Johannesburg and Rome. Bandung and Surabaya in Indonesia were also cut from the regional network. But in 2013 MAS increased ASKs by 17%, essentially restoring the capacity taken out in 2012 as well as introducing new gains that took monthly ASKs to new record highs. Of the destinations axed only one, Dubai, was restored. But capacity increases were pursued in several existing markets, particularly domestically and in regional routes within Asia-Pacific including Australia. The capacity levels MAS has been flying at both in the domestic and international markets over the last year was clearly not sustainable. MAS would have been better off keeping capacity at 2012 levels. Yields would have still come under pressure in 2013 due to the intensifying competition. But MAS would not have had to been as aggressive with pricing and could have focused more on leveraging service and product improvements as well as its new membership in oneworld, which it jointed in Mar-2013. At the time MAS executives were confident the aggressive pricing strategy would be temporary and eventually it would be able to raise yields while keeping capacity at the new higher levels. But even without the two incidents market conditions would have not been favourable enough to raise yields for at least another year. More heavy losses were inevitable. But the two disasters significantly exacerbated the situation, prompting MAS to reduce fares in many cases below the already very low levels. Maintaining capacity at 2012 levels seems like it would have been a more sensible move, particularly in hindsight. But to be fair such a decision would have resulted in huge inefficiencies as the 2012 restructuring did not include job cuts. As a result the initial capacity cuts resulted in lower employee productivity. At the time MAS concluded it was better off increasing capacity again and thereby improving staff productivity levels – as well as aircraft utilisation rates. MAS has restructured several times over the last decade but executives have never been able to tackle the underlying problems. Job cuts have typically been a no go topic because of union and political sensitivities. The new restructuring plan to be implemented by Khazanah is expected to include job cuts, reportedly representing up to 25% of the nearly 20,000-strong workforce. The job cuts should in theory allow MAS to cut capacity without impacting productivity. Essentially the 2012 restructuring could be reattempted with a higher probability of success. But several other challenges, including brand issues in the aftermath of the two incidents, also need to be overcome. Some routes will likely be cut as part of the upcoming restructuring but the capacity cuts will most likely be predominately achieved by reducing frequencies in existing markets. From a network perspective all the low hanging fruit was already pursued in the last restructuring. The long-haul routes that were cut in early 2012 had long been unprofitable but had been maintained for national reasons. The only obvious route cut that was not pursued in 2012 was Los Angeles, which the Malaysian government was initially reluctant to let go. But Los Angeles, which had been served via Tokyo, was finally cut at the end of Apr-2014, following a decision made in Jan-2014 (two months before MH370). The suspension of Los Angeles leaves MAS with only seven routes outside Asia-Pacific: Amsterdam, Dubai, Frankfurt, Istanbul, Jeddah, London and Paris. Dubai and one European route (most likely Istanbul) possibly could get the axe as well as some smaller regional routes within Asia-Pacific, including routes that have been launched over the last two years. The bulk of any capacity cuts needs to come from under-performing markets now served with multiple frequencies. Australia for example has seen a 36% capacity increase over the last year. The London market also saw a capacity increase of almost 40% in late 2012 when both of MAS’ two daily flights to Heathrow were upgauged to A380s. Australia is MAS' largest market based on seats and ASKs. 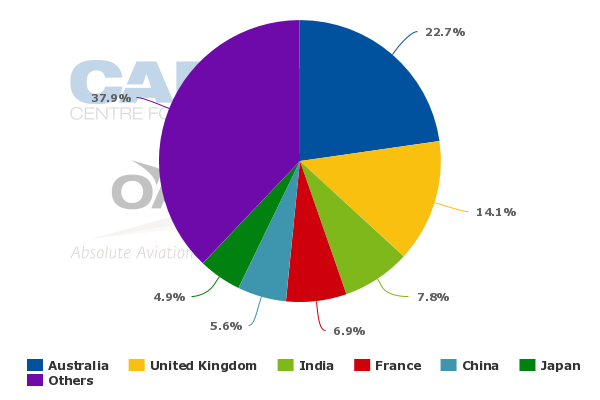 Australia currently accounts for 23% of the carrier's international ASKs and 14% of international seats, according to CAPA and OAG data. Europe accounts for about 29% of its ASKs with London accounting for nearly half or 14% of total ASKs. International ASKs started inching up in Dec-2012 and 1H2013, reversing the reductions implemented in early 2013. But the biggest gains came at the end of 2013, driven by expansion in the Australian market (primarily the introduction of a third daily flight to Sydney and Melbourne). For the full year in 2013 international ASKs were up 17%, bringing back capacity to 2006 and 2007 levels. 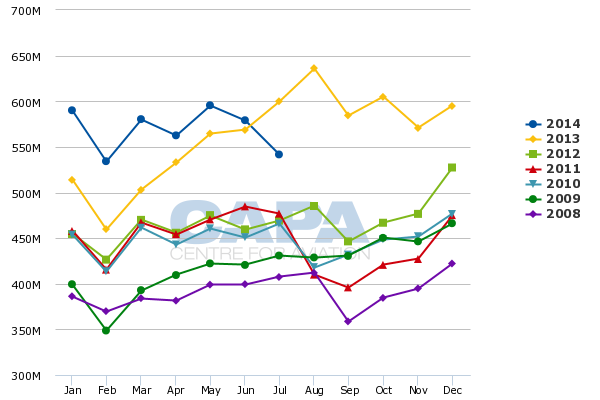 The peak came in 1Q2014, with 4.9 international ASKs flown in January and March. International ASKs have since come down slightly and were at 4.7 billion in Jul-2014. A stepper cut is necessary. Domestic capacity cuts are also very likely. Domestic ASKs increased by 20% in 2013, reversing several years of declines. MAS over the years responded to AirAsia domestic expansion by contracting but responded completely differently to the Mar-2013 entry of a third domestic competitor in Malindo. In mid-2013 MAS started pursuing 20% plus domestic capacity increases, raising monthly domestic ASKs to record levels. This put pressure on domestic yields as the huge domestic capacity increase by MAS came at the same time as Malindo’s entry and expansion from AirAsia. The domestic capacity increase from 2013 was also partly driven by an eagerness to increase narrowbody utilisation rates, particularly as MAS transitioned its 737 fleet from Classics to NGs. MAS did not increase the size of its fleet but instead pursued capacity increases through utilisation improvements, which resulted in a more efficient use of its fleet and staff. Utilisation rates will inevitably have to decrease, particularly on the 737 fleet as MAS completed the transition to 737-800s in Jun-2014. Reduced utilisation rates are not ideal but is a sensible move, particularly if MAS is finally able to bring down staffing levels to more competitive levels. MAS accelerated the phase out of its 737 Classic and 747-400 fleets in the last restructuring. MAS reported that as of mid-Aug the group’s mainline fleet consisted of 88 aircraft including 54 737-800s, 15 A330s, 13 777s and six A380s. The group’s regional subsidiaries operate 39 turboprops. The 777 fleet, which has an average age of 15 years according to the CAPA Fleet Database, is by far the oldest type in MAS’ fleet. Its 737, A330 and A380 fleets all now has an average age of less than three years. While MAS has come a long way in simplifying its fleet, additional aircraft orders are likely even as the carrier downsizes. The 777 replacement requirement is the most pressing. But MAS also will need to look at renewing its narrowbdy and medium-haul widebody fleets as it is the only major Asian carrier that has not yet ordered any new generation aircraft (A320neo, 737 MAX, A350, 787, or 777X). MAS had looked to order the A350 but slots were unavailable, but now those are opening up, partially as airlines shift to the A330neo. MAS currently has no widebodies on order. The group has only 13 more jets on order, all 737-800s. Three 737-800s are due for delivery in 2H2014 with two more slated for 2015. As a result deferrals are probably not necessary. But MAS could look to negotiate early return or sell excess aircraft, which would enable it to retain relatively high utilisation rates as it cuts capacity. MAS has had potential strategic suitors in recent years, ranging from Qantas to British Airways to more recently Etihad. Lack of stability in MAS' affairs, and what was perceived as reckless growth in some markets, put carriers off. A more rational MAS may find itself making friends, out of opportunity but also necessity. There are airlines that will be eager to fill any gap from MAS, and indeed some like AirAsia are ready to move quickly. MAS must be comfortable to let competitors have what it cannot make profitable. Important strategic decisions will have to be made in the coming months. No stone can go unturned as MAS may only have one final attempt to right the ship.